I've recently been on a lentil binge and have enjoyed creating different salad combinations with them. They're a great source of protein and make a wonderfully chewy base for salads. 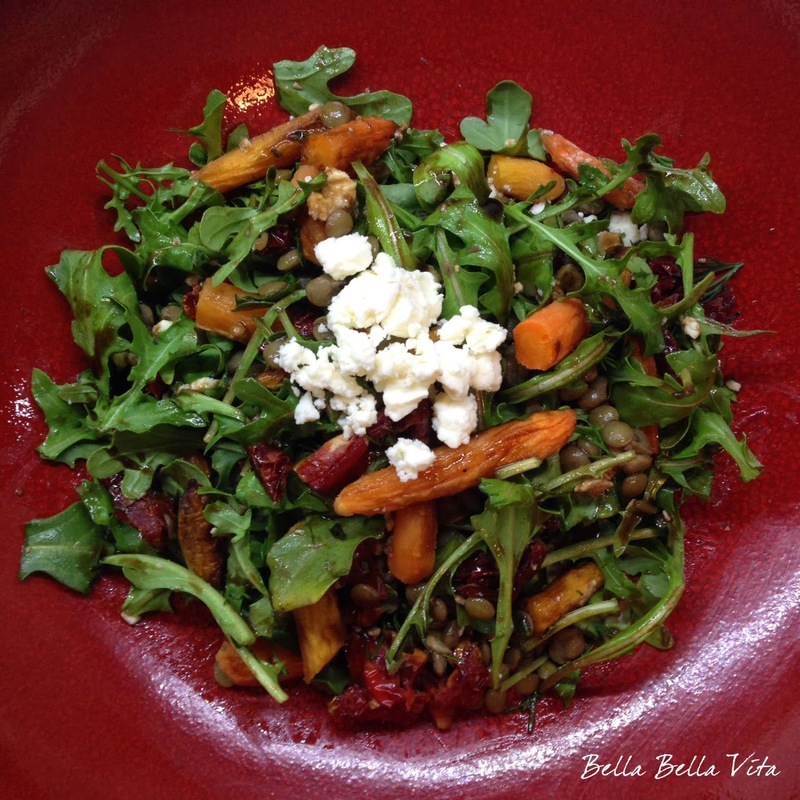 This version with roasted carrots, arugula, sundried tomatoes, dill and feta is my favorite thus far! Below are the ingredients I used, but there are endless combinations. I'd love to hear what ingredients you would combine - please comment! For great tips on cooking the perfect lentils, check out this article from The Kitchn. They're one of the best cooking blogs on the web! Also, read more about the health benefits of lentils here at Mind Body Green. Exact quantities not listed as it's up to your preference. To roast baby carrots: Preheat oven to 425°. Line a baking sheet with aluminum foil and coat with the olive oil spray. Arrange baby carrots in a single layer on the baking sheet. Spray with olive oil spray and/or drizzle with olive oil. Roast for approx 25 -30 minutes until soft and slightly browned (caramelized). Toss all ingredients together in a bowl. Drizzle with Balsamic vinegar or Balsamic vinaigrette dressing and toss until lightly coated. Enjoy! I like to tear or chop my arugula as it brings out the peppery flavor more and really enhances the salad.